The noble traditions of mechanical watchmaking are subtly celebrated and reinterpreted in a contemporary masterpiece imbued with a blend of ancestral know-how and the latest technical and scientific breakthroughs. The DB28 ST is nurtured by a horological culture and philosophy that its creators David Zanetta and Denis Flageollet share and perpetuate in a resolutely avant-garde manner at De Bethune. The research conducted on the miniaturisation of the grand regulator timepieces that were admired and collected by one of the company founders and lovingly restored by the other, testifies to their desire to bring the horological quintessence of these historical works to the wrist. Each aesthetic detail – from the choice of materials to the curves, the volumes, the shape of the hands, and of course the finishes – has its own specific reason for being. None are there by chance, and each contributes to a subtle equilibrium dedicated to purity, aesthetic restraint and readability. The soft gleam of the platinum bezel effects the transition from the cool shade of the titanium case to the warmth of the sterling silver chapter ring. The layered dial structure is built around suspension bridges featuring fine lines and multiple decorations serving to elevate the central mechanism as well as enhancing its functionality. The silicon/titanium De Bethune tourbillon, the lightest and fastest on the market, combined with the jumping seconds mechanism, are proudly displayed at the heart of this model, endowing it with peerless technical and aesthetic splendour. 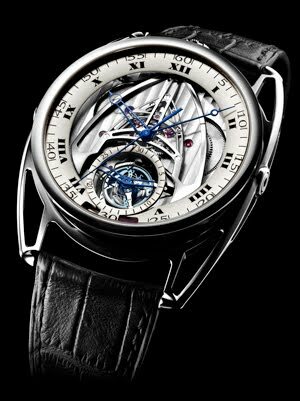 Excess is the avowed enemy of beauty, and De Bethune provides a resolutely 21st century expression of the grandeur of mechanical watchmaking through a determination to focus on excellence rather than excess.